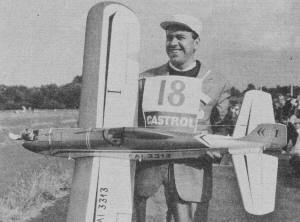 Although not mentioned in the article, the 1962 FAI R/C World Championships were held at Kenley Airfield about 15 km south of London, England. 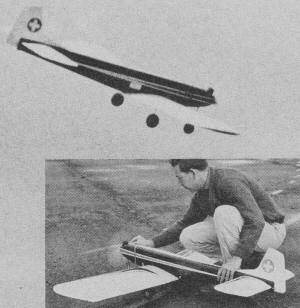 This article from a 1963 edition of American Modeler. If you had relatives who attended the event, this might be one of the best places to look to see if you can find him or her in the large number of photographs presented here. Flyers from the USA, Great Britain, Germany, South Africa, Italy, Belgium, Sweden, France, Switzerland, Japan, Holland, Norway, the USSR, and many other countries were in attendance. I read elsewhere that none other than Maynard Hill was one of the judges. It is interesting that at the time the FAI did not award a 2nd-place spot, but two 1st-place spots instead; was that one of the earliest examples of feel-good sports? 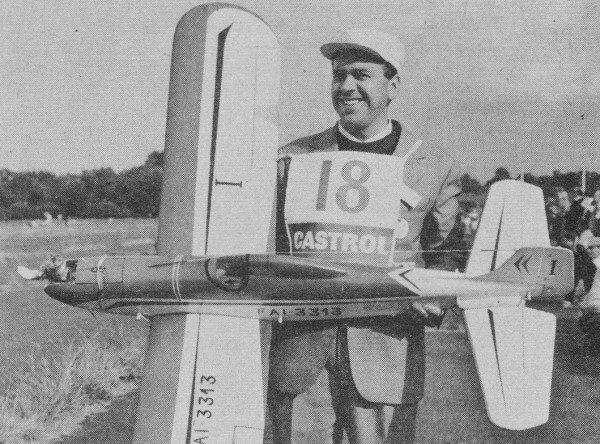 In addition to on-the-spot reports by FAI Champ Tom Brett and Marshall Two-Gun McEntee, here's every entry in the International radioplane championships. Note two "first" places and no second place .... that's the way the FAI operates! 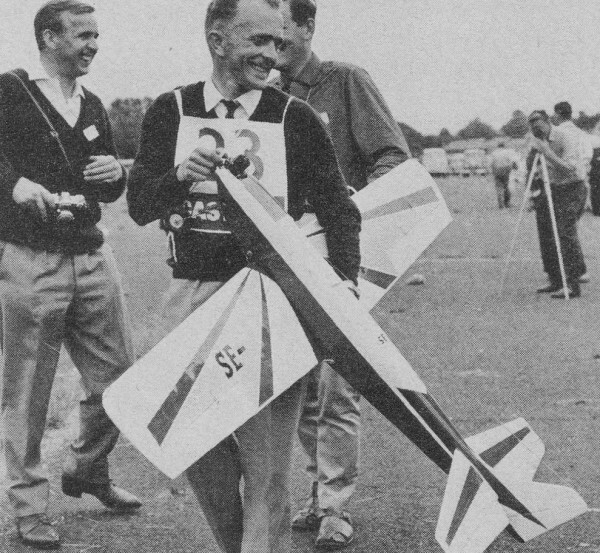 1 Joint Winner and World Champion·- Tom Brett, U.S.A. Engine, K&B 45; Prop, Rev-Up 11 x 6; Model, Original "Perigee"; Span, 60 7/8"; Length, 50"; Weight, 84 ounces; Wing Area, 570 sq. in. ; Wing Thickness, 15%; Radio, Orbit Superhet 10 Channel. 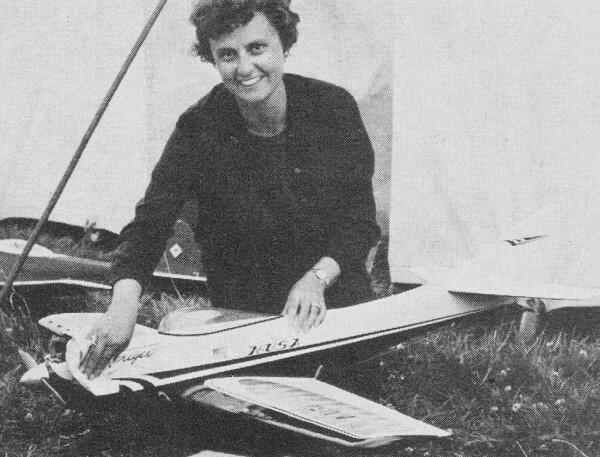 Helen Brett cleans up model after its winning flight. 3 C. Olsen, Great Britain. Engine, Merco 49; Prop, Tornado Nylon 11" x 6" (cut down from 12" dia. ); Model, Original "Uproar"; Span, 66"; Length, 50"; Weight, 94 ounces; Wing Area, 756 sq. in. 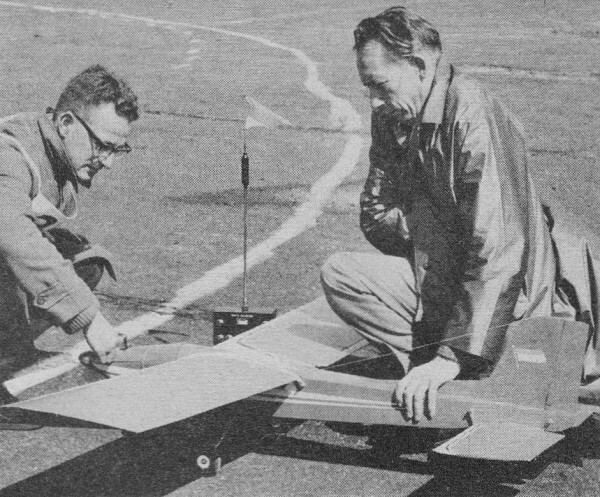 ; Wing Thickness, 12% (NACA 0012); Radio, Homebuilt 10 channel receiver (Super Regen with relays). 5 Don Brown; U.S.A. Engine, Merco 49 (deBolt clank tank); Prop, 12 x 6 Tornado Nylon; Model, Original "Ambassador"; Span, 74"; Length, 50"; Weight, 103 ounces; Wing Area, 768 sq. in. ; Wing Thickness, 15% (semi-symmetrical); Radio, Original Quadruplex proportional system (Dee Bee servos). 7 J. M. Malherbe, South Africa. 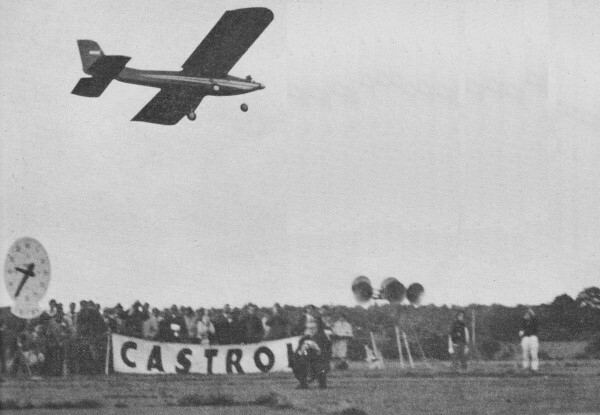 Engine, Veco 45; Prop, Top Flite 11 x 6; Model, Modified "Stormer" (flat-top type, full span ailerons, tricycle); Span, 64"; Length, 52"; Weight, 84 ounces; Wing Area, 720 sq. in. ; Wing Thickness, 15%; Radio, Orbit 10 Channel (Transistorized Superhet). Mechanic Bob Dunham is bundled up against chilling wind. 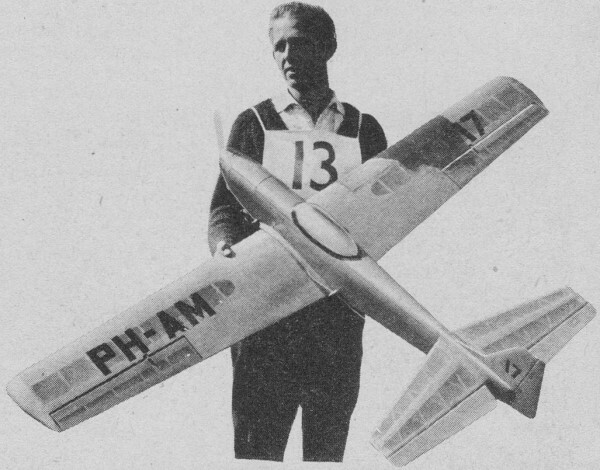 Malherbe built six similar models, all weighed within 2-oz.! 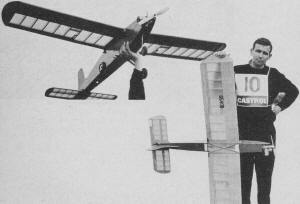 One of two at Kenley RAF air base seen in action. 9 W. Robinson, U.S.A. Engine, K&B 45; Prop, Rev-Up 1 x 6; Model, Original "Moody 2" (based on Jack Butler's original Moody) has lower cabin and narrower fuselage; Span, 72"; Length, 56"; Weight, 100 ounces; Wing Area, 756 sq. in. ; Wing Thickness, 17%; Radio, Orbit 10 channel all transistorized Superhet (all transistorized transmitter, Transmite servos). 11 H. Gast, Germany. 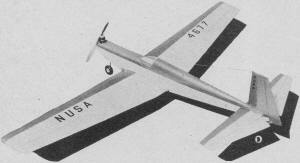 Engine, K&B 45; Prop, Tornado Nylon 12 x 6; Model, "Stormer" (Flat-Top version), with tricycle gear, no canopy, 1/2 span ailerons; Span, 71"; Length, 51"; Weight, 84 1/2 ounces; Wing Area, 720 sq. in. ; Wing Thickness, 15%; Radio, Bellaphon, with tune filters. 13 T. Corghi, Italy. Engine, Super Tigre 56; Prop, Super Record 11 x 6; Model, Original - by Corghi and R. Bacchi. 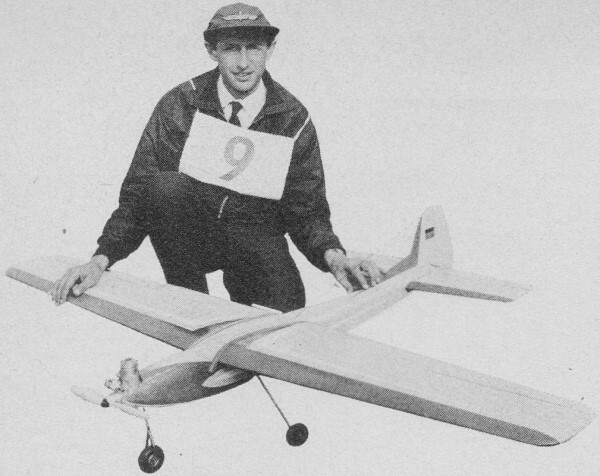 (Unique in having slight wing sweepback; low wing had half span ailerons, tricycle landing gear); Span, 72"; Length, 56"; Weight, 98 3/4 ounces; Wing Area, 852 1/2 sq. in. ; Wing Thickness, 17%; Radio, Controlaire superhet relayless (cells taped to outside of transmitter case). Mechanic Bacchi shown with model. 15 P. Eliasson, Sweden. Engine, Merco 49; Prop, Tornado Nylon 12 x 5; Model, "Mustfire" original, based on Mustang and Spitfire, designed by mechanic J. von Segebaden, a wind tunnel engineer, and fully worked out from design angle, not hit and miss effort; Span, 69 1/2"; Length, 52"; Weight, 120 ounces; Wing Area, 790 1/2 sq. in. ; Wing Thickness, 12%; Radio, Ace-Kraft 10 channel custom superhet. 17 P. Louis, Belgium. Engine, K&B 45; Prop, Power Prop 12 x 6; Model, "Nimbus" (Tom Brett design); full span ailerons, tricycle gear; Span, 68"; Length, 56"; Weight, 100 ounces; Wing Area, 716 sq. in. ; Wing Thickness, 15%; Radio, Orbit 10 channel Superhet, Transmite servos. 19 A. Matthey, Switzerland. 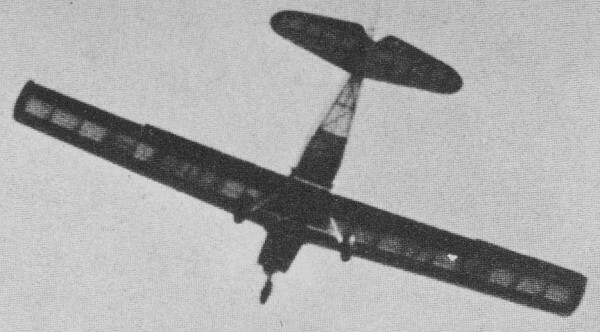 Engine, O. S. Max 49; Prop, Super Record (Italian) 11 x 6; Model, "Orion" with nose 3" longer than standard; Span, 68"; Length, 51"; Weight, 120 ounces; Wing Area, 700 sq. in. ; Wing Thickness, 15%; Radio, F&M 10 channel Hercules receiver with only 8 channels used. 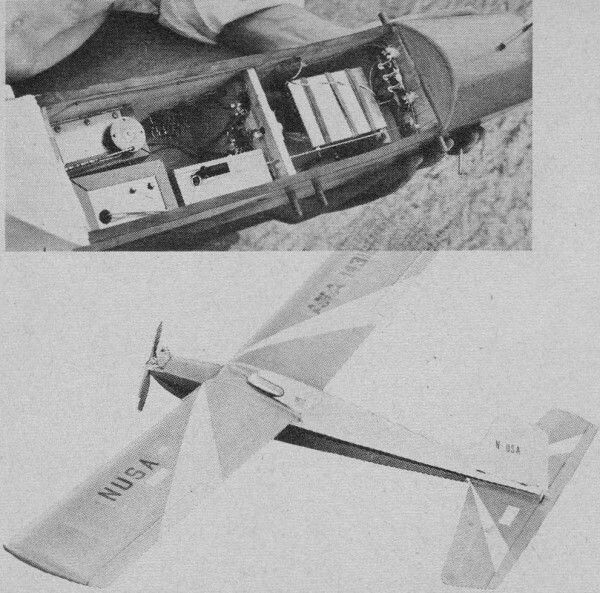 Midas transmitter . Transmite servos. 21 A. Bickel, Switzerland. 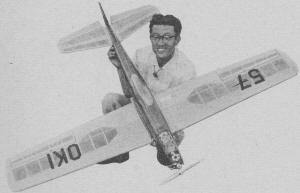 Engine, K&B 45; Prop, Tornado Nylon 12 x 4; Model, Original - neat, straight tapered surfaces - little dihedral, well cowled, side-mounted engine; Span, 74"; .Length, 51"; Weight 130 ounces; Wing Area, 821 1/2 sq. in. 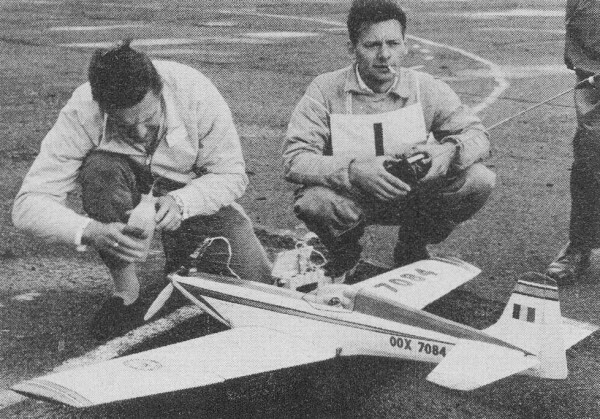 ; Wing Thickness, 14%; Radio, Nievergelt (original), pneumatic, home made servos. 23 (top) F. Plessier, France. 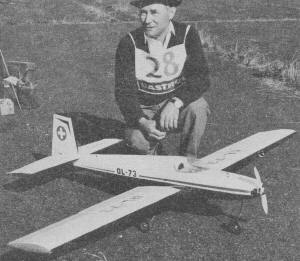 Engine, K&B 35; Prop, Top Flite 10 x 6; Model, Original "Grrr!" (sharks teeth on nose); Plessier is Major and test pilot in French Air Force, flies Mirage, claims his "Grrr!" was dirtiest model at Championships! Model slabsider, shoulder wing, dural landing gear (with axle); flew fine; Span, 62"; Length, 45"; Weight, 80 ounces; Wing Area, 682 sq. in. ; Wing Thickness, 15% (RAF 30); Radio,' Grauppner 10 channel Bellaphon, relay, triple proportional. 24 (bottom) J. Levenstam, Sweden. 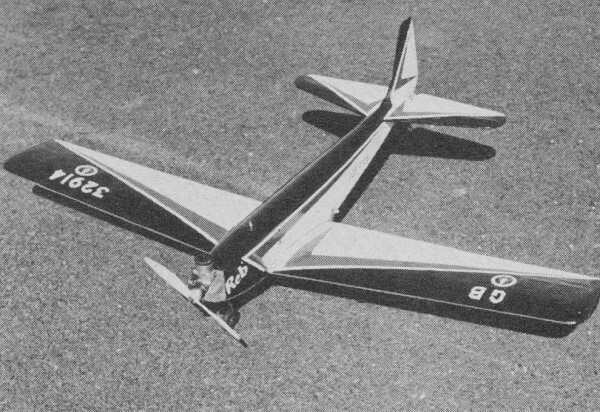 Engine, Merco 49; Prop, Tornado Nylon 12 x 4; Model, "Sonic-Cruiser" (deBolt kit design); Span, 68"; Length, 50"; Weight, 110 ounces; Wing Area, 710 sq. in. ; Wing Thickness, 12%; Radio, R.E.P. 8 Octon by Honest-Redlich, 8 channel, relay. 27 P. Marrot, France. Engine, K&B 45; Prop, Power Prop 12 x 6; Model, Original; Span, 70"; Weight, 106 ounces; Wing Area, 840 sq. in. ; Wing Thickness, 12% (NACA 2412); Radio, Original relayless 9 channel, with home-made reeds. Servo is transistor amplified; relay fitted inside servo case neutralizes servo on "off." 29 P. Velichkovsky, USSR. Engine, Super Tigre 35; Prop, Rev-Up 11 x 6; Model, Original. 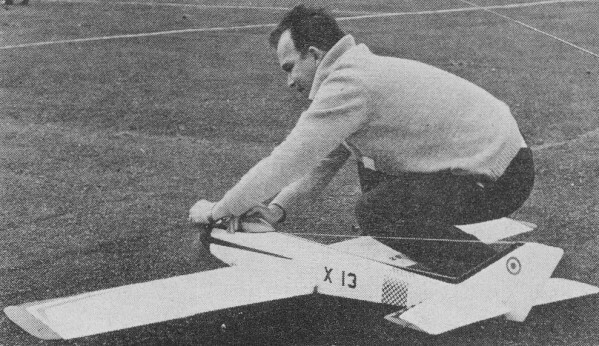 Semi-scale low-wing, access to R/C through large canopy (he also had another model, with Fox 59, which he crashed early in contest); Span, 74"; Length, 54"; Weight, 116 ounces; Wing Area, 775 sq. in. ; Wing Thickness, 15%; Radio, Home-made 10 channel. Team member Arler shown with model. Area, 690 sq. in. ; Wing Thickness, 15%; Radio, Copy of Orbit 10 channel relayless. 1 Joint Winner - Harry Brooks, Great Britain. 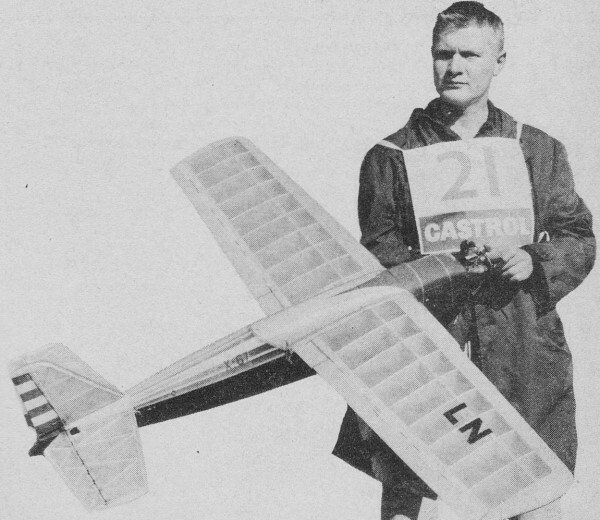 Engine, McCoy 60 (Rogers custom-rebuilt, Johnson Automix Throttle); Prop, Tornado Nylon 12 x 6; Model, Original "Reb"; Span, 69"; Length, 50"; Weight, 122 ounces; Wing Area, 695 sq. in. ; Wing Thickness, 15%; Radio, F&M Superhet 10 Channel. 4 Frank Van den Bergh, Great Britain. Engine, Merco 49; Prop, Tornado Nylon 12 x 6; Model, Original "Sky Dancer"; Span, 60"; Length, 50"; Weight, 104 ounces; Wing Area, 690 sq. in. ; Wing Thickness, 12 1/2%; Radio, Orbit Superhet 10 Channel. Frank is seen with Team Manager Stewart Uwins (at left). 6 F. Bosch, Germany. 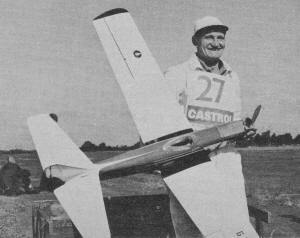 Engine, Super Tigre 56; Prop, Tornado Nylon 11 x 6; Model, "Voltswagon"; Span, 70"; Length, 51"; Weight, 120 ounces; Wing Area, 650 sq. in. ; Wing Thickness, 8%; Radio, OMU·Multi-control (relayless, Transmite servos). Wife is rated as Grade A mechanic! 8 G. Samaan, Germany. Engine, Merco 49; Prop, Tornado Nylon 11 x 6; Model, Original; Span, 74"; Length, 52"; Weight, 81 ounces; Wing Area, 806 sq. in. ; Wing Thickness, 14%; Radio, Graupner Belaphon 10 channel, simult. & proport. (Polyton transmitter - fully tranisistorized, but Super Regen relays.) Samaan, wearing Walt Good's AMA cap - a popular swap item, is former Wakefield champ. 10 C. Teuwen, Belgium. Engine, K&B 45; Prop, Tornado Nylon 12 x 6; Model, "Valkyrie 2" based on Bill Bertrand's design, but with 2" longer original fuselage. Stab area also increased and 15% thick wing in place of 9%. 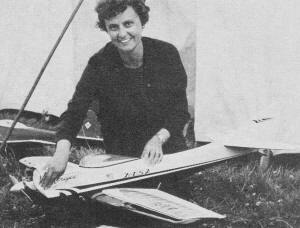 Wing section changed to NACA 2415 and symmetrical at tip; Span, 71 1/2"; Length, 50"; Weight, 114 ounces; Wing Area, 720 sq. in. 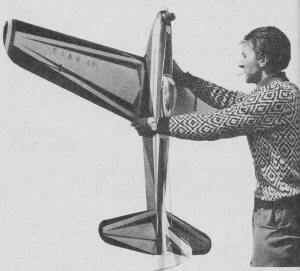 ; Wing Thickness, 15%; Radio, Orbit 10 channel Superhet (transistorized transmitter). 12 A. Bellochio, Italy. 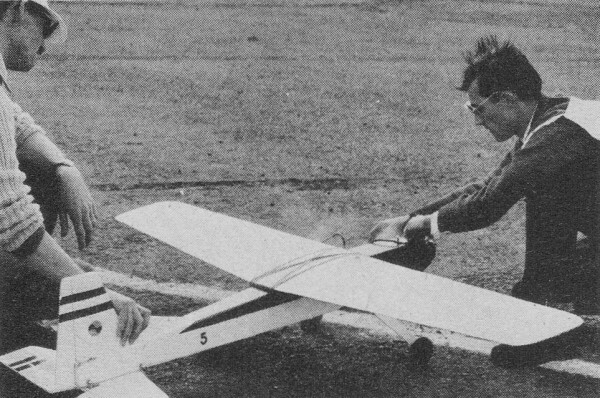 Engine, K&B 45; Prop, Power Prop R/C 12 x 6; Model, Original design; Best of his 3 models was damaged due to broken aileron linkage during practice landing; Span, 68"; Length, 50"; Weight, 113 ounces; Wing Area, 666 1/2 sq. in. ; Wing Thickness, 16%; Radio, Orbit 10 channel Superhet, Orbit transistorized transmitter, Transmite servos. 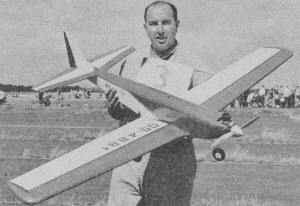 Mechanic Scaglia shown with model. 14 M. Kato, Japan. 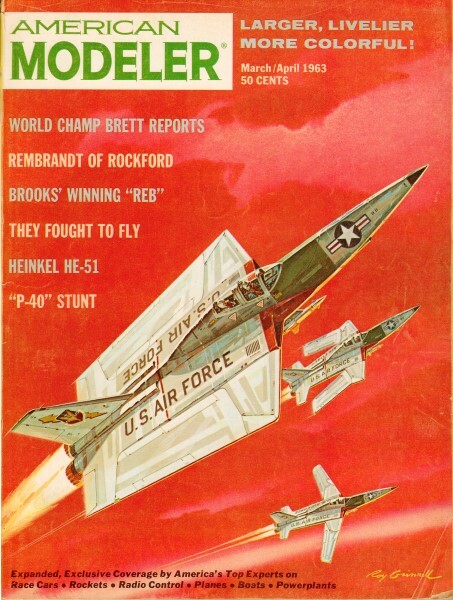 Engine, K&B 45; Prop, Top Flite 11 x 6; Model, Original "Thunderchief" (showed Orion influence); Span, 68"; Length, 49 1/2"; Weight, 80 ounces; Wing Area, 682 sq. in. ; Wing Thickness, 15% (NACA 2415); Radio, Orbit 10 channel Superhet (with Kato's own M.K. servos). 18 R. Dilot, Sweden. Engine, K&B 45; Prop, Tornado Nylon 12 x 5; Model, "Orion" modified, tricycle landing gear (not steerable); Span, 69 1/2" Length, 50"; Weight, 105 1/2 ounces: Wing Area, 690 sq. in. ; Wing Thickness, 15%; Radio, Bramco relayless (removed relays and changed circuit). 20 J. De Dobbeleer, Belgium. 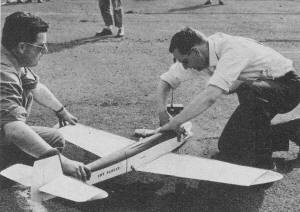 Engine, K&B 45; Prop, Power Prop 12 x 6; Model; "Orion" modified, increased area ailerons; Span, 72"; Length, 51"; Weight, 100 ounces; Wing Area, 619 sq. in. ; Wing Thickness, 15%; Radio, Orbit 10 channel Superhet. 22 H. Oki, Japan. Engine, Enya 45 T.V. ; Prop, Tornado Nylon 11 x 6; Model, Original (showed Orion influence), steerable nose-wheel; Span, 70"; Length, 49"; Weight, 106 ounces; Wing Area, 705 sq. in. ; Wing Thickness, 15%; Radio, Chimitron 10 channel, relay, super regen, Duramite servos. 25 V. Miliani, Italy. Engine, Super Tigre 56; Prop, Tornado Nylon 12 x 6; Model, Astro Hog (had vertical wire spike on nose to slow model on landing); Span, 72 1/2"; Length, 53"; Weight, 134 ounces; Wing Thickness, 15%; Radio, Alletti relayless 10 channel; Transmite servos. 26 F. Martens, Holland. 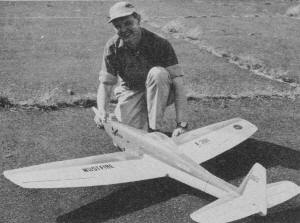 Engine, K&B 45; Prop; Tornado Nylon 12 x 6; Model, Orion; Span, 72"; Length, 50"; Weight, 113 ounces; Wing Area, 690 sq. in. ; Wing Thickness, 15%; Radio, Home-made Orbit 10 channel relayless (copied from production receiver). 28 A.A. Arler, USSR. Engine, Webra Twin F.6; Prop, Hand carved 13 x 6; Model, Original (designer Alexander Arler, 40, is a model building teacher at Moscow Central Air Club, building R/C models for 10 years. Model had tricycle gear, detachable wing panels (from 4" stubs attached to fuselage, detachable tailsurfaces); Span, 94"; Length, 58"; Weight, 135 ounces; Wing Area, 1080 sq. in. 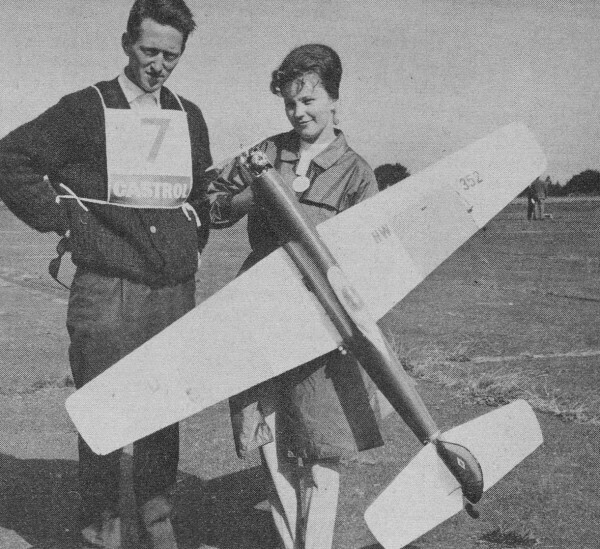 ; Wing Thickness, 11.5%; Radio, "Rum-1," produced by Soviet Aero Club. 8 channels. Pneumatic, reed. 30 W. van de Hoek, Holland. Engine, Veco 29; Prop, Tornado 9 x 4; Model, Original. 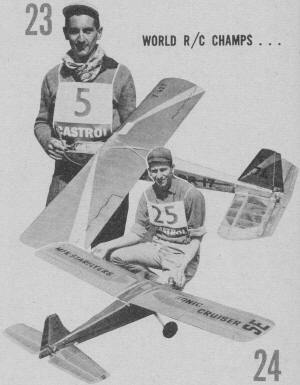 Low-wing, Tricycle gear, brakes on front leg, not steerable; Span, 60 1/2"; Length, 45 1/2"; Weight, 84 1/2 ounces; Wing Area, 600 sq. in. 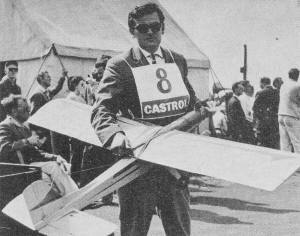 ; Wing Thickness, 12%; Radio, Orbit home-made 8 channel, 2 transistors, 1 tube. Vacuum system. 32 P. Stephansen, Norway. Engine, Enya 29; Prop, Tornado Nylon 10 x 4; Model, Original; shoulder wing, dural gear; Span, 57"; Length, 46"; Weight, 87 ounces; Wing Thickness, 17 1/2%; Radio, Home-made, 3 channel proportional, all transistorized. Model crashed due to temperature difference problems. It was cold when tuned before contest, hot during most of contest.